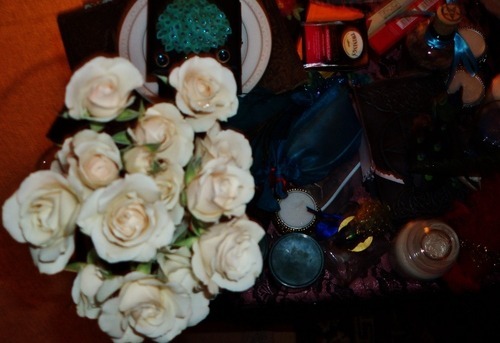 other people’s altars | O, Mourning Star. . .
You are currently browsing the tag archive for the ‘other people’s altars’ tag. 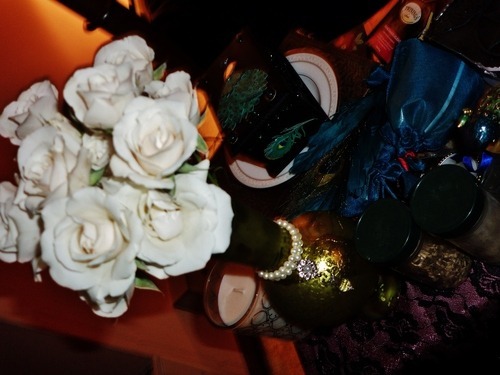 Fresh white roses I bought for Lucifer’s altar, today. *blushing* I just couldn’t resist getting him some lovely flowers. Finally got that altar thing set up. I don’t know if this is going to last, since he never asked or cared if I keep an altar for him, but I wanted to do something. So there’s the picture, of course. That’s my favorite picture of him, no, it’s not made by yours truly. (I have plans to make a clay statue and a painting, but we’l see when I get the time to actually make them) Then there are those blue crystals I found today, they just begged me to buy them. Also the blue bottle, maybe I put prayers in it or something. Then there is this stone candle holder/underlay/Idon’tknowthenameinenglishsorry, which was a bargain, and the black candle (black is always been the color I associate him the most). Then there is this lantern, where you put water on the little bowl on top of it and some essential oil. (Scent of the day is apple). Then there is this glass candle holder, where at the moment is an little apple that I picked from an apple tree just outside my apartment. And some essential oil bottles. What I want to get there is magpie feathers, and maybe other feathers as well. But always when I see a magpie I think of Lucifer, so I definitely want magpie feathers. My current altar set up for Lu. The hydrangeas are fake, the forget-me-nots real—made that bouquet just a bit ago, in fact. The incense, which I have never lit due to quick-to-extinguish matches, is of a “Garden of Eden” scent. Those two glass stones that have “faith” and “wisdom” written on them, I found those at a bookstore nearby. The journal came from the same bookstore, and is full of accredited devotional writings and quotes I associate with Lu. I’m planning on making it bigger and better looking for Lu. But this is all I can do for now. Any advice for a beginner in this?